Hon. Judah Colt (1761-1832), one of Erie County's earliest citizens, settled at Colt Station, 1796, as the agent for Pennsylvania Population Co., the county's first land developer. Moved to Borough of Erie, 1804, serving as Burgess, 1813 & 1820-21. He built this Federal style house about 1820 at the S.W. corner of E. 4th & French Sts. where he entertained Marquis de Lafayette (1757-1834), June 3, 1825, during his celebrated visit to U.S. Also, home to nephew Hon. Thomas G. Colt (1805-1861), last Burgess and, in 1851, first mayor for newly incorporated City of Erie. House moved c. 1890 to 345 E. Front St. due to its poor condition, was dismantled and rebuilt here in 2018. Location. 42° 7.976′ N, 80° 4.791′ W. Marker is in Erie, Pennsylvania, in Erie County. Marker is on German Street north of East 5th Street, on the left when traveling south. Touch for map. Marker is at or near this postal address: 302 East 5th Street, Erie PA 16507, United States of America. Touch for directions. distance of this marker. 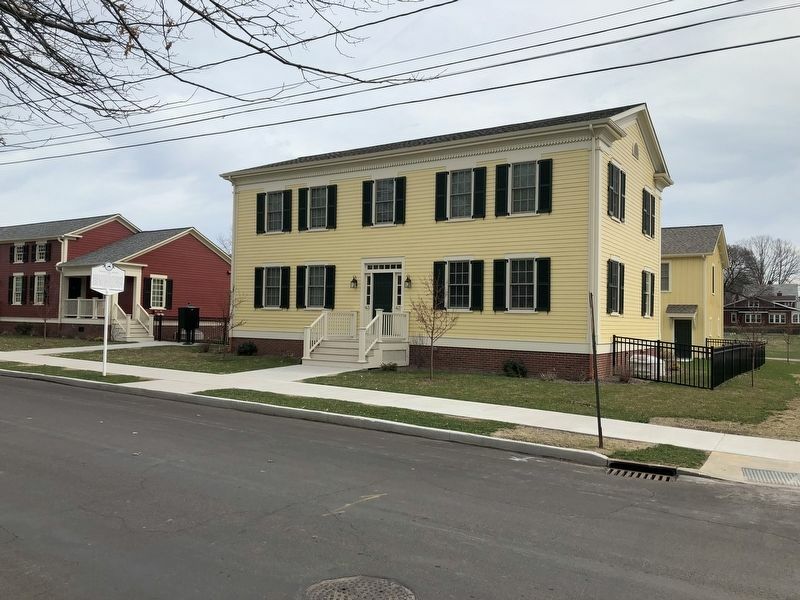 von Buseck House (a few steps from this marker); Brewery Lane (about 500 feet away, measured in a direct line); Conrad-Brevellier Houses (about 700 feet away); Pennsylvania National Guard (about 700 feet away); Kennedy Double House (about 800 feet away); Kennedy Row Houses (approx. 0.2 miles away); Fort Presque Isle (approx. 0.2 miles away); Brewster House (approx. 0.2 miles away). Touch for a list and map of all markers in Erie. More. 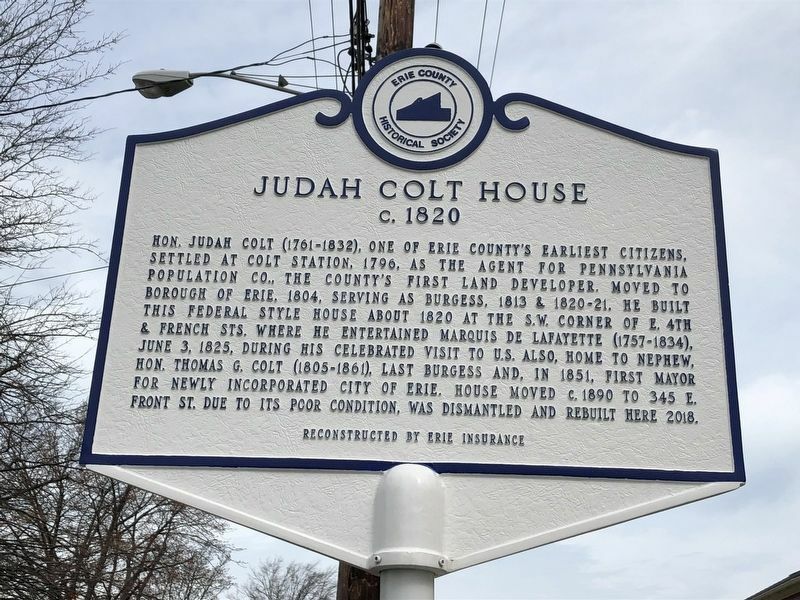 Search the internet for Judah Colt House.